I was just wondering if there are many people out there willing to exchange information on walks round Kintyre? There must be an abundance of knowledge from walkers who take to the hills, coasts etc of Kintyre which could be shared? Great idea ... it strikes me that that clever web tool for mapping runs would be a helpful tool to collate such walks. http://www.mapmyrun.com/. I don't suppose that there is anything to stop people using it for walks as well as runs. Thanks Mary. Yes, I was just wondering over the holidays - when seeing so many people out walking (number of them on the way to the pub I might add!) that there is a wealth of knowledge on walks that could be shared. Could even merit its own thread like MOKRUN! Super 4th Gen! Sounds a good walk - perhaps it could be organised for this May. Took the bull by the horns this morning as it is a cracking day and headed up Beinn Ghuilean - more to follow on this but here are a couple of quick snaps. Super! Beinn Ghuilean is pretty good on the track - worst bit by far was crossing the field at the back of the graveyard - was really muddy, but now realise I could have crossed later and that is why, perhaps, the markers are down????? We can start up a full thread on walking and see how it goes? Similar to what we have for MOKRUN which, as you can see, works really well - can't keep up with them! Will pencil this in for later in the week but in the meantime do we have other walkers out there who think this would be a good idea? Kintyre Forum News wrote: but in the meantime do we have other walkers out there who think this would be a good idea? Good thinking DP, especially after all the festivities . The marathon side is just a wee bit fast for my old joints, but walking . 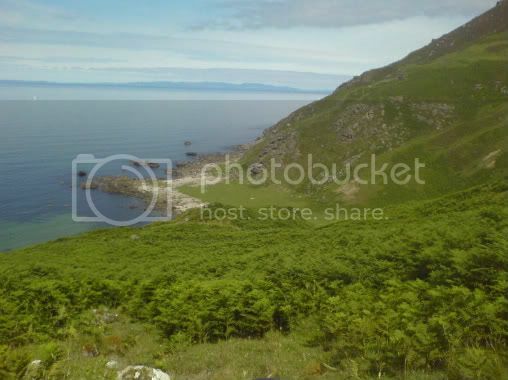 I will add the walks up this part of the country and also update the Kintyre Way Walk with some more pics. l thinks its also a great idea to have Kintrye own walking group,l have see many a good walker out strip a runner "the old tortise and the hare story". Also us runners can glean some info of your thread ref the terrain etc or run a route you would recommend the two can go hand in hand.Its like the LDWA (long distance Walkers Association) they set routes and all turn up and do their stuff.Its nice to do off road, at what ever speed that takes your fancy. Would read your thread with the same enthusiasm as l do the MOK and l sure it would get other people intrested and joining in.I would certainly join in on some walks (subject to time and family ties). Just back from a walk round Beinn Ghuilean, lighter nights mean it will soon be an after work walk. I recently visited Inneans Bay for the first time in over 20 years, quite expecting the walk from and back to civilisation to be spoiled by the intrusiveness of Kintyre Way paths and signage. However I was much impressed by the discreet and considerate installation of Way markers, and path construction. Certainly, it seems no more invasive than similar walking routes in Austria or Norway. The walk to the bay from Ballygroggan took a little over one and a quarter hours (accompanied by two small children) - I'm certain it was much further 20 years ago! Even the more arduous route over Cnoc Moy to Largybaan seemed less of a relentless slog than I remember from my youth, possibly thanks to the periodic, but not too frequent, Way marker posts. For spoiling neither a great day out nor a nostalgic visit to the braes of my childhood, I'd like to give a big thumbs up to the Kintyre Way. I last visited the Inneans Bay in 1997, and noticed that the Sailor's Grave was in a dreadful state. I can remember it in the 1970s when it was adorned with glass fishing net floats, and there was even a poem inscribed on the cross, and it looked as if it was being looked after. In 1997 it was overgrown and the cross was lopsided and tied together with orange twine. I actually took a photo of it which I have somewhere in the house.